In 1990, former Los Angeles Mayor Richard Riordan, in partnership with committed community leaders, launched the Riordan Leadership Institute (RLI) to address the gaping chasm between professionals interested in serving on nonprofit boards and nonprofits looking for qualified, diverse board members. Since then, more than 1,300 professionals have graduated from RLI and are among the region’s most dynamic community leaders. RLI is a nine month fellowship empowering early­ to mid-­career professionals for lifelong community engagement and leadership through service on nonprofit boards. Newly restructured course curriculum will ensure RLI fellows have the tools to be effective nonprofit board members, including a clear understanding of board governance, fiscal responsibilities, fundraising, giving pro bono service, corporate social responsibility and personal leadership development. As fellows develop a succinct balance of nonprofit board skills, they will have the opportunity to simultaneously apply those skills through training and field experience with a nonprofit board. Previously administered by the L.A. Junior Chamber Charity Foundation, the Riordan Leadership Institute is now a part of the SCLN family of programs. Riordan Leadership Institute alumni have full access to continued education and networking opportunities through SCLN’s extensive alumni programming. Tuition for Riordan Leadership Institute is $2,500, which includes full participation in seminars, all materials, meals and ground transportation. A 10 percent discount is available for SCLN alumni and members of the L.A. Area Chamber of Commerce. Limited scholarships may be available for qualified candidates with demonstrated financial need. If you are interested in applying for a scholarship, please indicate on the application once it becomes available. For more information, contact Jessica Coronel, 213-580-7537. The application is now open for Riordan Leadership Institute class. Early application deadline is June 14, 2019. 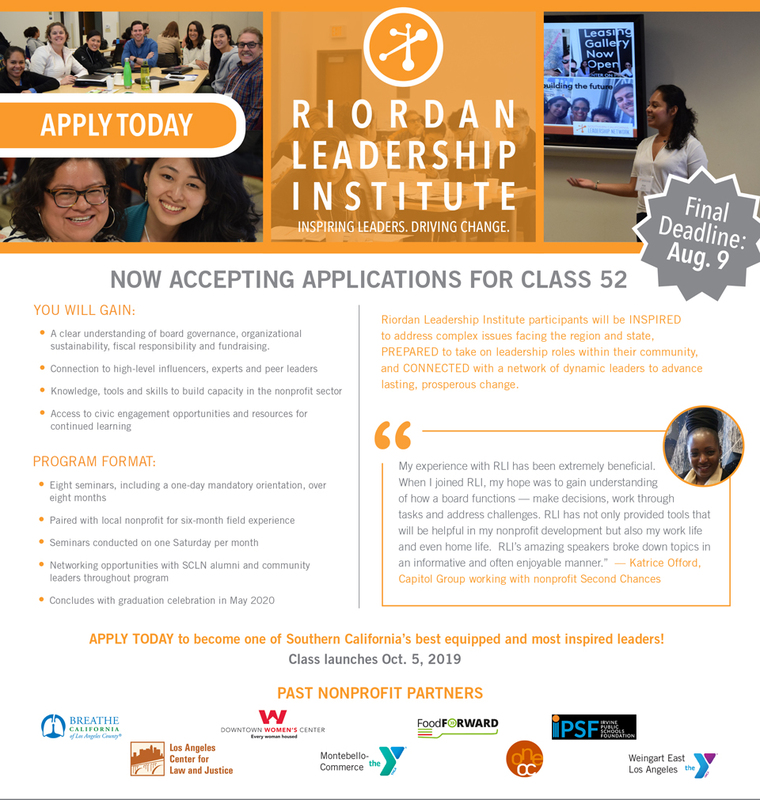 The Riordan Leadership Institute (RLI) is a nine-month board training and matching fellowship that empowers and prepares diverse professionals for lifelong civic leadership as nonprofit board members. Unlike other board training programs, RLI also helps local nonprofit organizations build their capacity and connect with prospective board members who are drawn from the professional ranks of major businesses, have a strong history of community involvement, and are ready to make a commitment to serve on the board of a nonprofit organization. In addition to classroom training, RLI fellows are paired with a local nonprofit partner for a six-month field experience to gain a better understanding of the nonprofit’s mission and the community it serves, as well as the strategic and tactical issues facing nonprofit boards. The application period for this class of Nonprofit Partners is closed. Applications for the next class will be made available Summer 2019. Please see the Nonprofit Partner FAQ for more information. You can also contact Erin Tanenbaum at 213.580.7526 or etanenbaum@lachamber.com with any questions.